I dont care that I am supposed to be a mature and serious *snort* grown up person. I want to read this! I bought this recently for my daughter’s 4th birthday on recommendation from a local children’s book seller and it is already a firm favourite. The first thing I noticed was the stunning, whimsical illustrations. I particularly love the amazingly detailed silhouettes (we have found something new to look at with each exploration) and the wonderfully expressive animal images throughout the book.Having chosen this one for its gorgeous illustration, I was immensely pleased to discover the charming, witty and modern fairytale within.While the princess is beautiful, if a little bedraggled, her true beauty shines through in her personality. No ordinary, down trodden fairytale princess in need of rescue here. Our Princess is self confident, independent and pragmatic. Rather than being swept off her feet by a handsome prince after a single night of dancing, SHE rescues HIM.While we are in no doubt of Princesses feelings for her Prince, a man who makes her laugh and supports her unconditionally, she is not defined by their relationship. At one point during the story it looks as though things won’t work out and while the princess expresses sadness, she picks herself up and prepares to get on with her life.There is no happily ever after assumed here, just the promise of a beautiful shared future based on mutual understanding and goals. A much healthier and realistic role model for our daughters!Verdict: An exquisitely illustrated modern fairytale.Caroline. By Ursula Jones, sister of Diana Wynne Jones!Illustrated by Sarah Gibbs, whose Rapunzel I loved!Sadly, not at the library. C’era una volta una Principessa che non aveva un regno. Aveva, però, un pony e un carretto. Ogni giorno, la principessa guidava il pony e il carretto in lungo e in largo, cercando il suo regno. Quando pioveva apriva un ombrello rosso per tenersi all’asciutto. E ovunque andava, la gente le diceva: «Hai trovato il tuo regno, principessa?»La fiaba di Ursula Jones è semplicemente adorabile e le illustrazioni di Sarah Gibb ancora di più. Un piccolo regalo di fine anno assolutamente gradito. Consigliato a tutti gli appassionati di fiabe illustrate. There is something so very British about the humor in this book that I can't quite put my finger on. Something about the contrasts, I think, of a fairy tale princess in the same sentence as bath buns and public libraries.The princess who has no kingdom also has no background; we are simply told she is a princess without a kingdom and that's that. She now has a cart and horse, driving about delivering odd packages like "troublesome grannies and lame dogs" in order to make money. Also, when she is spitefully gifted with some old hand-me-down princess style gowns, she sees nothing wrong with selling them to make money.The princes drives her cart around loaded up with pretty objects, tumbled on top of each other in utter disregard of the laws of physics – a gleaming candelabra stacked atop an empty gilded picture frame above a spindly legged chair, never tumbling out as you would think they would at any little bump in the road. When she's invited to tea with the dowager duchess and her six rude daughters, the six lovely ladies sit at the table, their eyes fluttered shut, too busy looking beautiful to take in their surroundings, while the princess stares ahead, politely but openly, at the handsome jester as he tells a joke that she gets and laughs at heartily, not shy at expressing her feelings, good or bad.There is then a ball, a fight, a wooing, a marriage, and still the princess searches for her kingdom, until she finds it rather unexpectedly… I wonder if the illustrator studied ballet. There is something about the stance that all the characters take that suggest they are all about to start leaping about in defiance of gravity in order to convey their emotions. Also, the fashions all the characters wear have the suggestion of a ballet costume – an outfit that shows off a tremendous amount of beautiful detail and contains all sorts of layers and frou-frous – but also has a cut and length to it that allows for movement. The one stumble in the whole book is when the two main characters celebrate their engagement at Longfellow's Wayside Inn, a restaurant that is just so quintessentially Massachusetts, it didn't fit the rest of the British tone of pictures or text. An odd mistake among such a perfect 10 of illustrations. If the illustrator was so set to give the inn a name, a generic British name like "The Red Lion" or "The Fox and Hound" would have worked better, or, if she felt she just had to stick a real place in there, "The Trip to Jerusalem Inn" is perhaps the most well-known English Inn.But overall, a charming original fairy tale – pretty and funny at the same time. 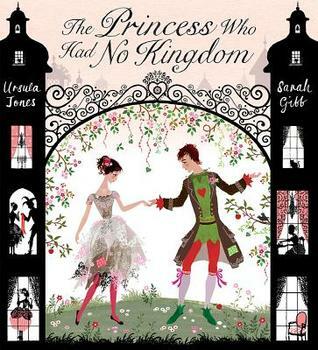 As the book's title suggests this is a tale of a princess, named Princess, who had no kingdom. What she did possess was little to speak of: a cart which she used to deliver odd items that could not be mailed through the post; a red umbrella to shelter her from the rain; and a pony named Pretty, who pulled said cart. Each day the princess would roam from town to town and all through the countryside searching for her kingdom, and whenever she passed the home of another royal she would politely stop in to pay her respects. One day she stops in to see a dowager duchess and there she meets a kind court jester. When the duchess suspects that her son the prince might fall in love with this poor beauty she devises a plan to keep him distracted for the day. Before long Princess meets him anyway after a coronation is announced and all royals are summoned to court. What follows is a hilarious set of circumstances that forces Princess to head for the hills, and upon doing so, she finally finds her kingdom and her king. This was a delightful fairy tale with interesting and refreshing twists on a timeworn genre.The art too is exquisite, comprised mostly of color flats and silhouettes featuring characters in profile for the most part, which keeps things simple and straightforward so as not to overpower or upstage the wonderful narrative. I truly enjoyed this book and highly recommend it. Although her peripatetic lifestyle might not be recommended, the princess at the center of this book offers a good role model for young readers. For reasons never made clear in the book, she is a princess without a kingdom. As she and her pony and cart travel through the countryside, she hopes to eventually find her kingdom. Although some of the royalty she encounters treat her rudely, she remains gracious and kind. Young readers familiar with fairy tales will expect her to sweep a prince or two off their feet at the ball, which does happen. But she flees the scene when things get out of hand, and the royals engage in a wasteful food fight. When she meets the man who becomes her prince, she's the one who helps him out, which is a nice turnaround from the traditional fairy tale. Lovely illustrations with a great deal of detail alternate with silhouettes that allow readers to read between the lines to figure out what's happening. Ultimately, it becomes clear that being a princess has more to do with one's actions than what one possesses. I enjoyed this one thoroughly. A stunningly beautiful look at a nontraditional princess who's on a quest to find her kingdom. Her journey requires her to be resourceful enough to make a little money by offering to haul unusual loads with her horse and cart and her happy ending perhaps never quite looks like the myriad of princess stories out there, but she finds willing companions to share the road with.Digital artwork makes generous use of silhouettes and incorporates luscious patterns and details that beg readers to devour this story time and time again. This modern day fairytale is a fresh take on the idea of what it means to be a princess and girly girls will be very pleased with all the decadence to be found in spread after spread.Recommended for PreK-2. A Disney kind of a story, simple theme dressed up in longish text and confectionary illustrations. Too much of the stuff that doesn't matter, too much like an 'instant classic.' And even though it's supposed to be smarter than traditional fairy tales, there's still insta-love. But I did love the thrift of selling royal cast-offs and being disturbed about the food fight... so, rounding up from 2.5 stars. Gorgeous illustrations, whimsical and charming, with some superb coloring and wonderful silhouettes. The story is cute and sweet, though I found the Princess and the Jester's first real conversation to be highly improbable. But seeing as one can hardly create a believable romance in less than 10 pages of full text AND have a story to go with it, I tried not to dwell. A lightsome little picture book. Charming art. About a princess who travels about on her cart, looking for her kingdom, and earning her living carrying odd objects from one place to another.And her interactions with various royals along the way. An elegantly illustrated contemporary fairy tale reflecting adult sensibilities but still accessible to young readers. I love Sarah Gibb’s beautiful and fabulously detailed illustrations. The silhouettes are truly adorable. The story is witty indeed, fresh, and unique. One of my favorites! The illustrations are SO LOVELY, and Madam and I very much enjoyed the scene with the pastry fight, but the ending fell flat for me. Gorgeous illustrations and a lovely message: love is more important than wealth or possessions. My daughter and I love reading this. The silhouette artwork gets 5/5 stars. This book is absolutely gorgeous! The princess isn't shallow, but hard-working and humble. The idea that together she and the jester would build their kingdom (family and home) together wasn't as concrete as it could have been. Very young readers may not quite grasp the ending/meaning. I picked this book because I fell in love with the art. A perfect match with this heart-warming and poetic storytelling. My 7 year old sister and I loved it! This book would have gotten five stars just for the illustrations, which are gorgeous and I fell completely in love with them. Fortunately, the story is also sweet and enjoyable, make this a delightful picture book. I wouldn't usually include a childrens book on my reading list, even though I am guilty of dipping into a fair few (mostly for nostalgic reasons; re-reading the ones I loved as a child like The Tiger Who Came To Tea and On The Way Home!) however my big sister bought me this for Christmas and so I want to include it so I don't forget.This is a sweet story about a princess who has no kingdom. My sister bought it for me as she said it reminded her of me and I can totally see why! The princess drags her prized possesions around with her on a horse drawn cart, and those items mostly consist of bird cages, ribbons and tea pots! Which (having moved house about 10 times in 5 years) are the main (useless!) items I seem to cherish most as I move from house to house. The book is beautifully illustrated with foil printing and metallic patterns. The drawings are so detailed that there is lots to look at and notice each time you glance back at the page. Of course it is still a childrens book so quick & easy to read and a simple story, but it's a sweet little love story and not your usual cliche prince and princess ending like you'd expect.It definitely warmed my heart and made me smile, and does make a nice unusual gift! It is one I'll keep until I know any children (non currently!) who might want it read to them. This is a very different sort of fairy tale since the princess does not have a kingdom of her own and also lacks any wealth. She travels around other kingdoms delivering packages. As she journeys she looks for her kingdom, assuming that a princess must have a kingdom somewhere. She stops and visits other royalty but as she isn't wealthy and has no kingdom they treat her to their second best everything, except the court jester who shares with her his very best joke and a pair of his red tights (because her feet looked cold). And yet despite everything several princes and even a king want to marry her because of her charm and beauty (and very possibly her red tights). In fact they are so determined that they get into a food fight over it, which does not impress the princess. Instead she heads off to find her happiness elsewhere.I thoroughly enjoyed this story. It's a typical fairy tale in that the good are rewarded, but not necessarily in all the ways one might think. I like the idea being expressed that happiness can be found in love and family and finding our own 'kingdom' even if it isn't a typical or even tangible place. And Sarah Gibb's illustrations are beautiful and sweet. This picture book is whimsical and tender without being too treacly. While we can see whom the princess will eventually marry, the road towards this foregone conclusion isn’t quite so straight and narrow. The illustrations are simply divine, artfully mixing black silhouettes with splashes of color. I almost expect this to be a pop-up book, since they convey the same sense of two-dimensional pictures that are meant to be three dimensional. The only real problem I had with it is with a glaring lack of names where they are needed. The titular princess doesn’t have a name. Her would-be husband doesn’t get a name. The dowager duchess has a name as do the princes who bid for the princess’s hand in marriage. Even the horse is called Pretty! But the PWHNK goes without one. What kind of sense does that make? This book has important messages to convey to small kids, ones about being kind, generous, helpful and good natured, trying to find yourself or your place in the world no matter what anybody thinks and seeing people for who they really are instead of what they wear. But they can’t be bothered to give their central characters names instead of labels? Pfft.This book is truly beautiful to look at and read but I suggest that future re-prints correct these errors. The Princess who had no kingdom traveled everywhere looking for her kingdom. She did not waste her time or act better than everyone else. She put her traveling to good use by making money delivering hard to carry items. She visited as a princess in many fine homes as any good princess should. She went to the king's coronation. But of all the prince's who offered her a kingdom for her hand in marriage, it is the court jester who steals her heart.The illustrative style of this book is very different. It reminds of something from the Victorian era. Many times the characters are drawn as silhouettes while only certain parts of the page are in color. This makes the pictures intriguing. The illustrations are gorgeous in a sophisticated way and the details draw the eye.The story is also unique. Not your typical princess meets prince and they fall in love. Both characters are hard working and see what really matters in life. I highly, highly recommend this book. The story may be too mature for the littlest ones, but would be enjoyed by ages 5-6 and up. So whimsical, in a good way! The princess with no kingdom rides through the land with a cart and a pony, making her living delivering items you can't mail. She hopes to find her kingdom someday, but in the meantime she has a pretty good life (and a good head on her shoulders, in my opinion). A chance meeting with dowager duchess Wilhelmina leads to an invitation to a royal ball. At the ball, there's a quarrel between potential suitors... and an ending that isn't what you'd expect, but is far more lovely thanks to the Princess's good sense. I do have two complaints. First, the foil on the cover seems gratuitous when Sarah Gibb's art is so charming. Second, I'm a little done with depictions of women in art where their waists are cinched in to be only slightly bigger than their necks. Historical accuracy just isn't that important unless you're curating a museum exhibit! Still, I do love this book. I grabbed this one largely because of the pictures--we discovered the illustrator, Sarah Gibb, from a version of Rapunzel that we checked out last fall, and she is fantastic. Her pictures are reminiscent of woodcuts, and they alternate between full-color-and-detail pictures and silhouette pictures. The story is an original, but reads like a fairy tale, and it's very good, too. Although, like many folktales or folktale-like stories, it's a little bit long, it didn't feel long in reading aloud. It follows a princess who doesn't have a kingdom as she sets out to find one, and I very much enjoyed the conclusion! This is a lovely little book about an atypical princess, but the world-building was odd and it mostly felt like a missed opportunity to me. I would love to read about a princess who travels around in her cart delivering packages (and puppies and grannies); or a princess who's offered second-best everything, because she has no kingdom; or even a princess who falls in love with a jester. I'm just not sure this book pulled those elements together well. The story felt to me like the silhouette illustrations that adorned it's pages - pretty, but distant, and ultimately unknowable. Ursula Jones Sarah Gibb - There is more than one author with this nameWhen I was little, I wanted to be an actress. I still wanted to be one when I grew up, so I became one!Having trained at RADA (Royal Academy of Dramatic Art) I worked in what was called ‘weekly rep’. The actors put on a play every week, performing one at night and rehearsing the next one during the day. It’s hard work. I shed kilos. Then I took a banana boat to Jamaica where I helped research a frog that hatches baby frogs and not tadpoles. I moved on to New York where I did some exciting, experimental theatre. Back in England, I was lucky enough to join the Unicorn Theatre for Children in London.It was there that I discovered I wanted to be a writer, too. And so that’s what I did. I wrote lots of plays for the company, and I haven’t stopped writing for children since.I work in London and from a small house on the edge of a forest where Moon, the cat, Turpin, the dog and his daughter, Beatrix, make room for me. Beatrix has more the look of a hairy marrow than a dog but she can’t see herself so she doesn't care. (Full bio available at official website).